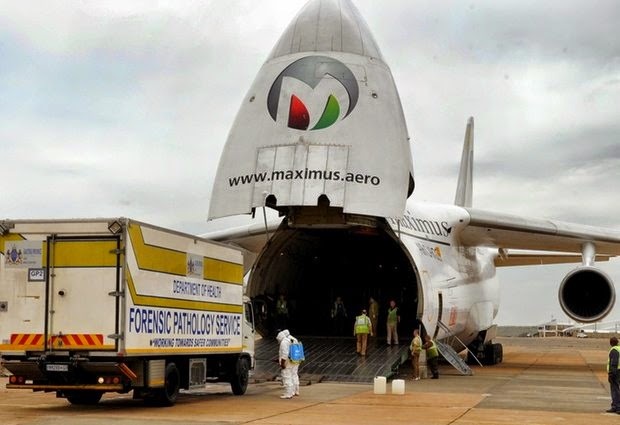 In this hand photo supplied by the government's Department's of Communications (DoC) one of four Forensic Pathology Services truck carrying the remains of some of the victims of the Nigeria building collapse, exits a chartered plane on it's arrival from Nigeria, in Pretoria, South Africa, at the Waterkloof Air Force base Sunday, Nov. 16, 2014. The remains of 74 South Africans who died in he building collapse on Sept. 12, 2014 arrived back in South Africa ahead of a ceremony at which the names of the dead were read to mourners. JOHANNESBURG (AP) — A plane carrying the remains of 74 South Africans who died in a building collapse in Nigeria on Sept. 12 arrived on Sunday in South Africa. The plane landed at Waterkloof air force base near Pretoria, the South African capital, ahead of a ceremony at which the names of the dead were read to mourners, including family members and government officials. Some relatives wept during the somber event. The "gruesome nature" of the accident had made it difficult to identify victims and DNA tests had to be conducted, the government said in a statement. South Africa said 81 South Africans were among a total of 116 people who died in the building collapse. The fallen multistory building served as a shopping mall and guesthouse at the sprawling complex of televangelist T.B. Joshua's Synagogue, Church of All Nations, on the outskirts of Lagos, Nigeria's commercial capital. Nigerian officials had attributed the cause of the accident to shoddy construction. The church tried to implicate Islamic militants, releasing a video that purported to show a mysterious aircraft flying low over the building before it fell.